20 luxury ground-floor suites offering the discerning traveller quality accommodation. A minimum of 48 hours notice from our Check In time is required for the cancellation or amendment of a reservation. will result in the full amount being charged. We reserve the right to accept reservations subject to a minimum stay over peak periods. "Check In" time is between 1:00pm and 9:00pm. Please call the motel direct if you wish to "Check In" outside of these times. Check Out time is 10:00am. There will be an extra charge if you have not departed by the required time unless prior arrangements have been made. Payment preference is either Visa, Mastercard, Diners or American Express. Credit card surcharge applies. 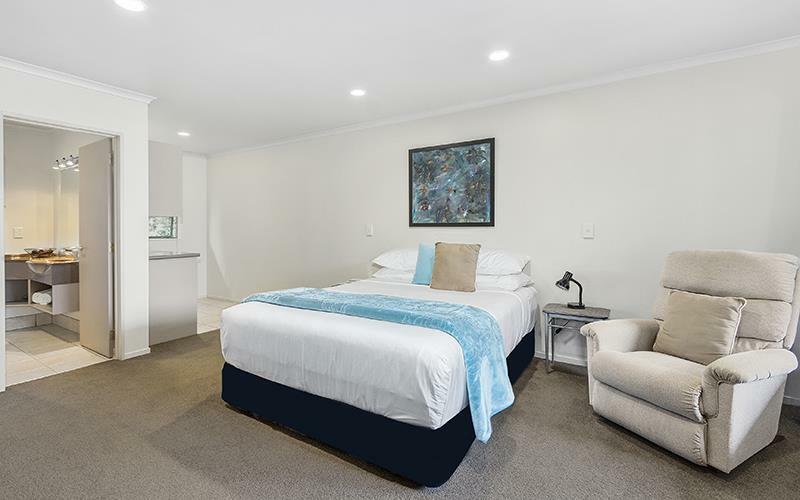 When making a reservation, and your payment method is either, Eftpos, Cash or Debit Card a deposit of one nights accommodation per room is required to secure your booking and must be made on the day of booking either by internet banking or credit on your debit card. Preferred method of payment must be correctly entered on your booking, failure to do so could result in your booking not being accepted. If booking for a team please be aware certain conditions apply including a security bond. Please contact the motel, direct for those conditions otherwise your booking may not be valid. Failure to advise the Motel of any extra guests over and above the number indicated when booking, will result in your booking being cancelled. This practise is frowned upon and deemed to be an attempt to defraud. No refund will be made and Police may be called. Visitors are permitted at the managements discretion but must leave the premises by 9.00pm. The registered guest is responsible for the behaviour of all persons/visitors whilst on the property. As parking is at a premium we ask that your visitors park out on the roadside. Studio units consisting of 1 x king-size bed. These units have separate shower, kitchen with microwave, electric frypan, toaster and jug. Open-plan living with work desk. All units have flat-screen TVs, Blu-ray DVD player electric blankets, iron and ironing board, hairdryer, clock radio and free wireless internet. Access units have a king-size bed and a single bed.These units have separate wet shower with seat, kitchen with microwave, electric frypan, toaster and jug, open-plan living with work desk area. All units have flat-screen TVs, Blu-ray DVD player, electric blankets, iron and ironing board, hairdryer, clock radio and free wireless internet. The one bedroom apartments are ideal for those who like to spread out and a looking for that extra space. The living area has a kitchen with stove top, microwave, toaster and jug, open plan dining/lounge. The bedroom consists of a king-size bed. All one bedroom units have two person spa baths. All units have flat-screen TVs, Blu-ray DVD players, electric blankets, iron and ironing board, hairdryer, clock radio and free wireless internet. Our two bedroom apartments have a large living area consisting of a kitchen with stove top, microwave, electric frypan, toaster, jug, fridge/freezer, open-plan dining and lounge and private outdoor area. The bathroom has a double spa bath and separate shower. To complete the package two separate bedrooms with bed sizes personalized to your requirements. ie: two king beds or one king bed and 2 singles or one king and 3 singles etc. All units have flat-screen televisions, Blu-ray DVD player, electric blankets, iron and ironing board, hairdryer, clock radio and free wireless internet.